Habitat Post & Beam designs and manufactures custom post and beam homes, additions and commercial/specialty structures, shipped to your site to be assembled by a local contractor of your choice. We will work with your personal design ideas, your architect's design, or from our extensive library of plans - there is no extra charge for our design services. We will customize plans to create the style of home you desire, providing engineer-stamped blueprints and the materials for a weathertight exterior shell. 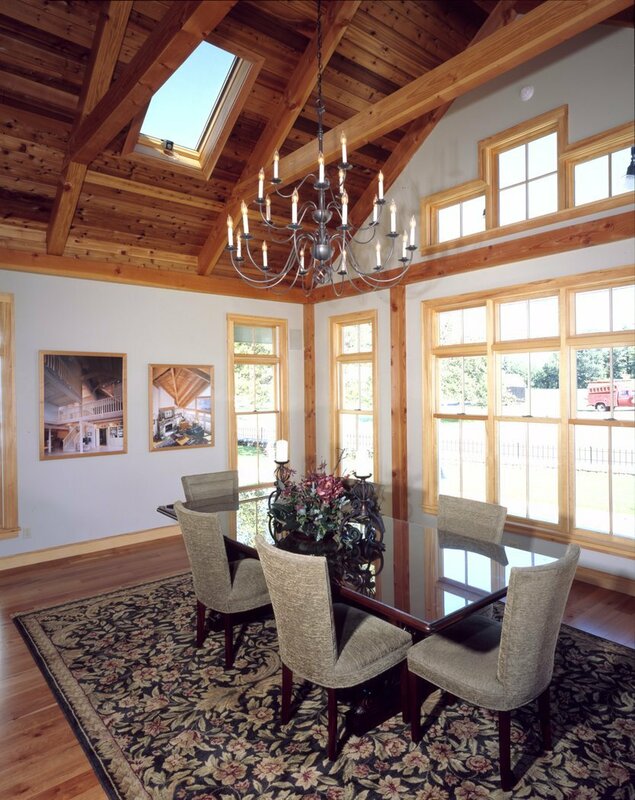 We use high-quality materials such as pre-cut #1 grade Douglas fir timbers and premium Andersen® windows. These materials result in low-maintenance, energy-efficient spaces that feel bright and open. Habitat Post & Beam, Inc. was incorporated in 1972. Since that time we have shipped thousands of home, addition and commercial post and beam packages throughout the country. We stand behind the quality of our products with a 20-year product warranty. You will have a primary contact person who will guide you through the process, and will coordinate everything as your project moves from design and engineering into our manufacturing process and finally shipment to your building site. Habitat Post & Beam was founded in 1972 with a vision to produce high-quality, factory-designed and manufactured post and beam homes to be developed and marketed in the Northeast. South Deerfield, Massachusetts was chosen for its centralized location, railroad access, interstate highway proximity and local craftspeople who had great pride in Yankee woodworking tradition. Specializing in timber frames for the second home or vacation market utilizing excellent design talent, quality materials and skilled workers, the new Deerfield shop and office grew quickly. Realizing that many people had remodeled the area’s old tobacco barns into homes, and wanting to share some of the local heritage with its customers, Habitat commissioned a well-known architect to develop a primary home design series called The American Barn Home, which was based on the character and charm of the rustic barns. Having this line of homes in production at that time was fortuitous, as the vacation home industry waned when the 1970s oil embargo seriously impacted the economy. The Habitat team realized that it needed more than high-quality homes to meet their clients’ needs during the energy crisis. They immediately started working on a compact, energy-efficient line of homes, as well as dramatically raising the insulation value of the American Barn line. While the classic designs were fairly limited in variety, this was not the case with the new line of Habitat homes. Windows were maximized in the south face and skylights with window quilts were utilized. These designs were so successful they won a major national energy-efficiency contest sponsored by the Federal Housing and Urban Development Program. The HUD award inspired Habitat to supplement their line of homes with a series of energy-efficient additions. Thus, the Habitat Solar Room was born. Following the Solar Room design, many other addition lines were developed to complement a wide range of existing home designs. The British-style Conservatorymet with immediate success due to its elegance, and the Palladian room provided homeowners with a flexible great room addition. The result of this well-rounded addition series was that any home could subsequently benefit from an energy-efficient post and beam room. Custom additions continue to be a popular option for many of its customers. The 1980s boomed for houses, solar rooms/additions and commercial structures such as The Yankee Candle Company's first store here in South Deerfield, churches, farm stands and restaurants. In 1995 Peter May, who had been with the company for fourteen years and has had many years of direct experience in the building industry, became President of Habitat Post & Beam, Inc. Carrying on the tradition of innovation and commitment to the timber frame industry, Peter continues to implement new ways to improve manufacturing efficiency, explore new improvements to material package energy efficiency, increase design and engineering capabilities, and update information sharing in the digital media age. The facilities have expanded, and now include a detached showroom, a large two-story office building, a 10,000 square foot shop, and thousands of square feet of covered material storage. New production equipment has been added in the manufacturing shop, including five new cutting stations to streamline timber cutting and dado detailing. In the engineering and design office, we added two additional full-time designers, new computers and CAD programs, and a large-format engineering copier to make blueprint-sized, sharp, detailed prints. The use of Chief Architect®, a powerful software package for design, provides Habitat with its preliminary design work and three-dimensional perspectives for enhanced visualization. The renowned AutoCAD® program is utilized in the later stages of design. Habitat Post & Beam is looking forward to what the future holds as it enters its 40th year of its Tradition of Excellence.